I never know whether I should use the term remodel. 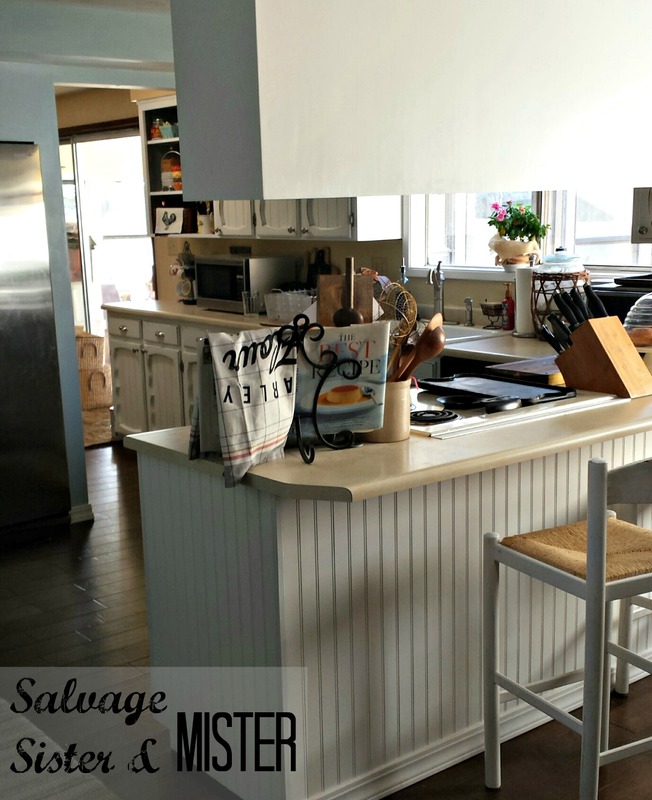 A kitchen remodel seems like tearing out, and completely changing everything! 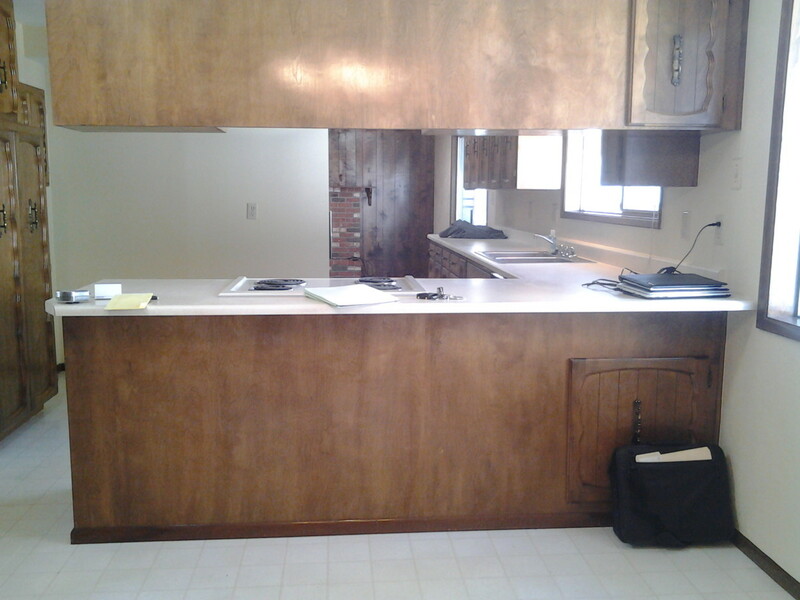 Well there was tearing out of some things and some change, but this was NOT a complete overhaul of our kitchen. The changes that we made are changes anyone can make, especially if you are on a budget. We partner with Amazon to find the products for you, so you can reference if needed. Rug from Tuesday Morning – These cloud rugs are normally 60-70 dollars but at Tuesday Morning they are half that if not more. I guess we can call it a low budget kitchen remodel. This is not the cheapest way to go, since we did purchase a few things like flooring, but it’s not even close to the average $18,500 for a minor remodel. 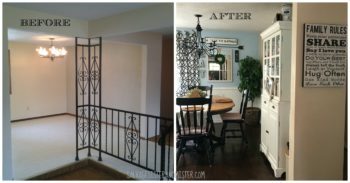 Ours was under $1000, including the pantry addition, which you can read about HERE. 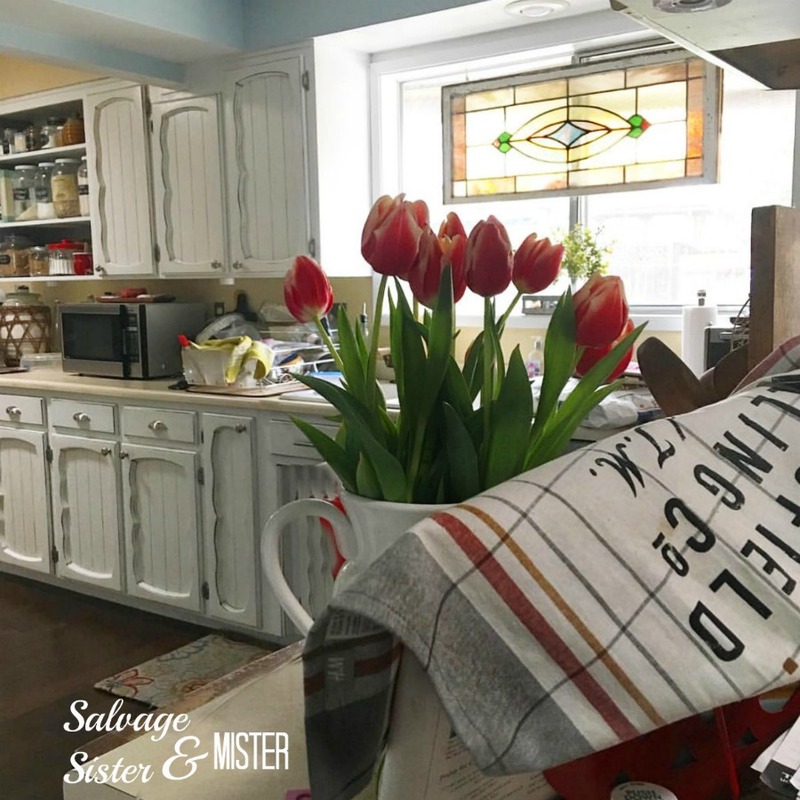 We would have liked to change the counter tops, change out the cabinets, new appliances, a farmhouse sink…well you get the idea. But no can do on our budget so we made the very best with what we had. And we’re thrilled with the results. 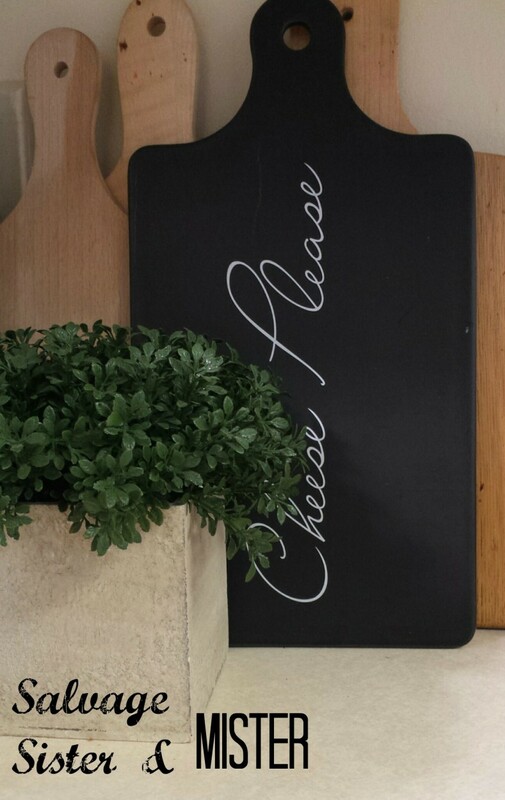 If you are interested in a SALVAGE DESIGNS consultation, designing around what you have, feel free to contact us for more information. « How’s Your Confidence This Morning? Kelly, Wainscoting is a big game changer. We love it too. Thanks for stopping by! Thank you Shelby for your kind words. We are happy with the results. Jamie recently posted…Have You Heard of the PawdPet? Jamie, The only reason this remodel was under $1000 is because of the pantry add on. 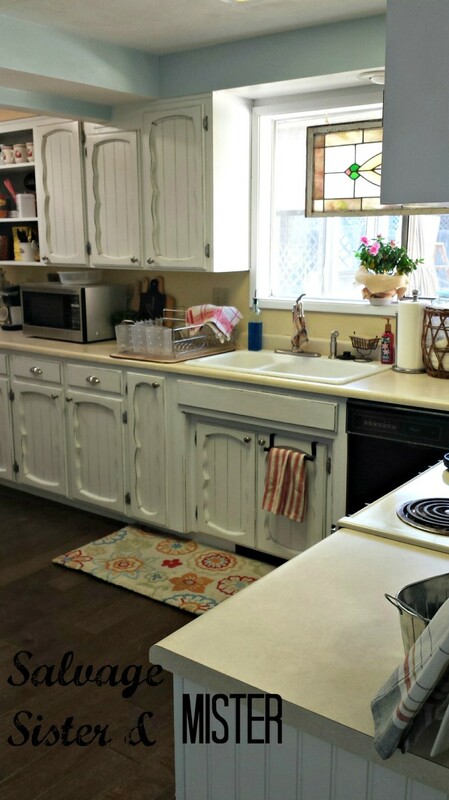 If you just paint the cabinets and spray paint the hinges, it is big changes for little money. 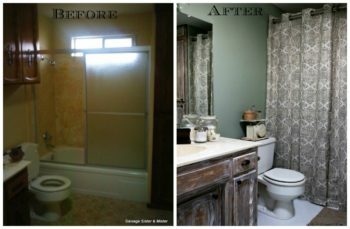 It looks amazing – like a completely different room! This year might just be the year I remodel my kitchen on a budget and I’m pinning this to refer back to for inspiration. And, by the way, I am swooning over that stained glass window hanging! Jen, I hope you get to do all your hearts desire this year! I love the look…somehow missed this post. You guys did a great job. and I like the jar next to the sugar jar! Kirstin, Thanks again! It was a jar from Harry and David on clearance! Plus I had my employee discount (at the time). It was so cheap! Looks great! I have that exact rug and I got it an Walmart. Love it! Marty, Thanks so much! This rug is so comfy! I love the cushion to it! I love this! What a difference it made for the whole room! Rene, Thank you so much. We really have enjoyed the changes. Appreciate you taking the time to comment! Rena, thank you so much. We are thrilled with the changes. 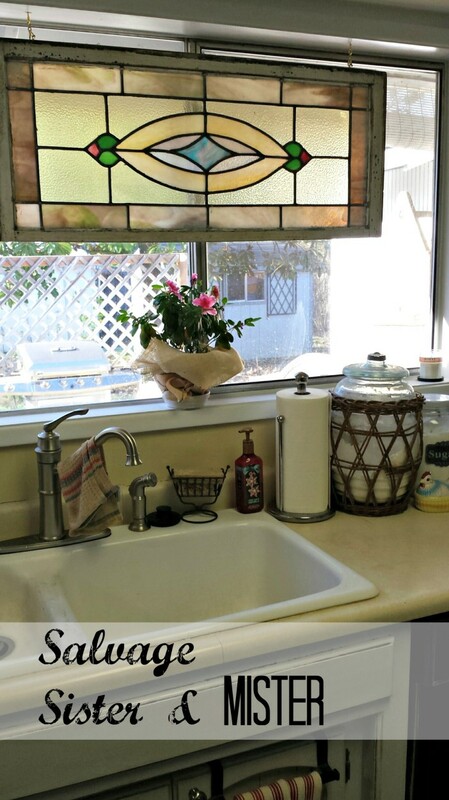 Beautiful kitchen Deborah! Nothing like DIY to save money! Have a great week! Aww Kendra, thanks so much for stooping by. Diy says so much money. Sometimes I wish it could go faster but at least we can do it. It looks great! You have me thinking of how we can do the same. Thank you! Pat, I hope if you do something you’ll show me a pic. Thank you Shelly for stopping by!!! This is an excellent example of how to update a kitchen, on a budget someone can afford. There are more folks in the world who do not have a $18,000 budget for a full redo then there are who do, I hope those people stumble on your site so they can see it’s possible. That is so sweet! That’s exactly what we hope for, to inspire people to make the most with what they have!